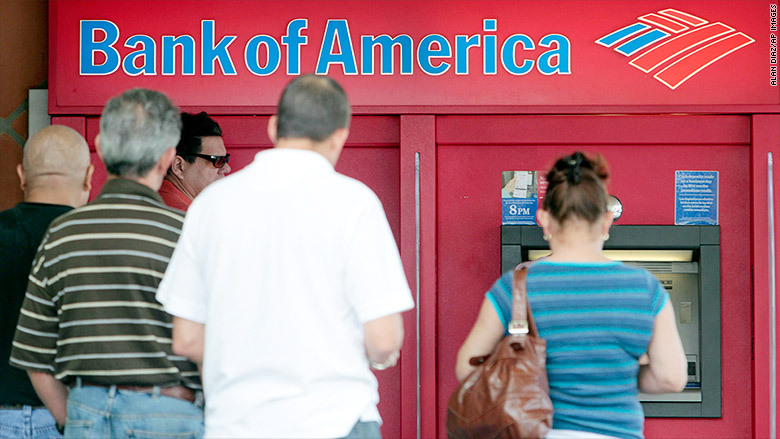 America's three biggest banks -- JPMorgan Chase (JPM), Bank of America (BAC) and Wells Fargo (WFC) -- made more than $1.1 billion on overdraft fees in the first three months of the year. Despite efforts to curb these charges after the financial crisis, they are still a big money maker for banks. If the fee collection pace keeps up, the big three banks are on track bring in $4.5 billion in overdraft charges by the end of this year. That works out to about $20 for every American adult. Banks aren't supposed to charge customers overdraft fees when they use an ATM to get cash unless the customer chooses or "opts in" to get the cash despite the fee. That said, banks can still levy a fee if someone's balance goes negative because a check is cashed or an automatic payment such as rent goes through and there aren't sufficient funds to cover it. A 2014 Pew study found more than half of the people who overdrew their checking accounts in the past year didn't remember consenting to the overdraft service. By law, people can also opt out of ATM overdrafts at any time. That way they will not be able to take out money at an ATM if their account balance would fall below $0. The Consumer Financial Protection Bureau is currently examining overdraft fees, especially when someone is charged multiple fees a day. The typical overdraft fee is $35. Banks had to disclose their overdraft fees for the first time this year. While the biggest banks have the most eye-popping figures, overdraft fees account for less than 6% of non-interest revenue at JPMorgan, Bank of America and Wells Fargo, according to an analysis by SNL Financial. These large banks have many other avenues to make money such as stock and bond trading, investment funds and moving money around for big business customers. In contrast, some smaller banks have become heavily reliant on overdraft fees to make money. Woodforest National Bank and First National Bank Texas both get more than 40% of their of non-interest revenue from overdraft charges, according to SNL Financial. The median is under 8%. Both banks are headquartered in Texas -- Woodforest operates over 750 branches in 17 states, while First National is active in Texas, New Mexico and Arizona and has over 280 branches. "These banks are highly reliant on these charges." says Tyler Hall, a senior bank analyst at SNL Financial. "It just points out that's their business model." In all, the nearly 600 U.S. banks that had to disclose their overdraft fees made just over $2.5 billion from consumers who overdrew their accounts in January, February or March.